[135 Pages Report] The pipeline safety market is estimated to grow from USD 5.57 Billion in 2016 to USD 8.67 Billion by 2021, at a Compound Annual Growth Rate (CAGR) of 9.3% during the forecast period. The base year considered for the study is 2015 and the forecast period is from 2016 to 2021. Supervisory Control and Data Acquisition (SCADA), Intelligent Video Surveillance (IVS), Human Machine Interface (HMI), Programmable Logic Controller (PLCs), and data analytics are some of the disruptive technologies likely to impact the future of the market. The integration of pipeline safety helps pipeline infrastructure system to monitor, analyze, and control the main network connectivity. Technologies and solutions such as SCADA for pipelines and pipeline monitoring systems have high global acceptance in the oil and gas industry. The global pipeline safety market is expected to grow significantly during the forecast period. North America is expected to hold the largest share of the market, followed by Europe. This report aims to estimate the market size and future growth potential of the market across different segments, such as technology and solution, verticals, services, and regions. The report also focuses on information regarding the key factors (drivers, restraints, opportunities, and challenges) influencing the market growth. Additionally, the opportunities in the pipeline safety market are providing strategic profiles of the key players to stakeholders present in the market, allowing the stakeholders to comprehensively analyze the core competencies and to draw the competitive landscape of the market. The pipeline safety market ecosystem comprises pipeline safety providers of technology and solution such as GE (U.S.), Schneider Electric (France), and Siemens AG (Germany) and service providers such as ABB Group (Switzerland) and Honeywell International (U.S.) that maintain and update the entire system and sell them to end users to cater to their unique business requirements. MarketsandMarkets forecasts the pipeline safety market size to grow from USD 5.57 Billion in 2016 to USD 8.67 Billion by 2021, at a Compound Annual Growth Rate (CAGR) of 9.3%. Need for sustainable use of resources and increased spending by oil & gas companies for infrastructure and network protection are some of the key factors driving the market. The other driving forces include the expansion and up-gradation of refineries, drilling sites, and exploration. The pipeline safety market is broadly classified into technologies and solutions, services, verticals, and regions. The technologies and solutions segment is further divided into perimeter intrusion detection, secure communication, SCADA for pipelines, pipeline monitoring solutions, and intrusion control system security. Compared to technologies and solutions, the services segment is expected to grow at a higher CAGR during the forecast period. The services in the pipeline safety market are aimed at enabling smart and coordinated decision-making processes and mitigating the risks and vulnerabilities of pipelines using efficient tools and techniques. Moreover, these services enhance risk management techniques and help to meet the end-to-end needs of all the verticals. The Supervisory Control and Data Acquisition (SCADA) solution for pipelines is expected to grow at the highest CAGR during the forecast period, as they are specifically focused on the needs of the oil and gas industry. Moreover, pipeline monitoring solutions offer flexibility and scalability to pipeline operators, which helps them to increase operational efficiency and data bandwidth as per their requirement. 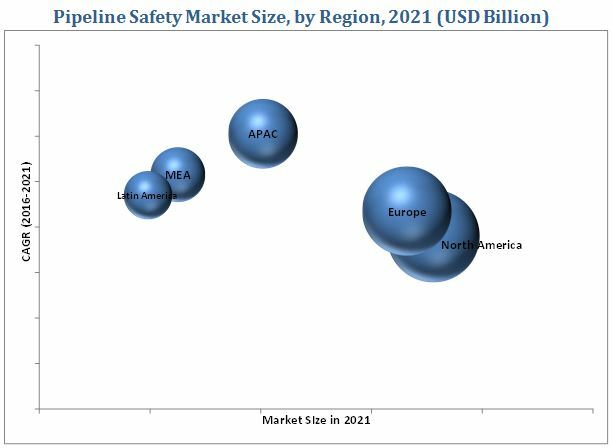 The pipeline safety market is segmented across five regions, namely, North America, Asia-Pacific (APAC), Europe, Middle East and Africa (MEA), and Latin America, wherein detailed analysis is provided. The analysis shows that the spending on the market is increasing globally due to the increasing investment in oil and gas pipeline infrastructure, especially in developing regions. North America is projected to dominate the pipeline security market during the forecast period owing to technological advancements and early adoption by oil and gas industries in the region. The market in APAC is expected to grow at the highest CAGR between 2016 and 2021. The reason for this is the increasing pipeline projects in China, Turkmenistan, Kazakhstan, and India. In addition, the rise in industrial automation in APAC has accelerated the growth of pipeline safety in this region. Pipeline safety will have extensive growth opportunities in the Middle East owing to the huge infrastructure investments in manufacturing, transportation, and utilities. The adoption of pipeline safety solutions and services is growing at a high pace in the developing regions, such APAC and MEA. However, lack of allied infrastructure, redundant ICT technology, and lack of awareness about current ICT trends prevent these regions from adopting pipeline safety solutions and services. Moreover, the growing population and political instability in the Middle East act as major restraining factors for the growth of the market. However, increase in pipeline infrastructure across the globe is expected to provide significant growth opportunities in the pipeline safety market. On a strategic front, many companies are utilizing different growth strategies, such as mergers & acquisitions, partnerships & collaborations, and product developments to increase their share in the market. For instance, in April 2016, Schneider Electric, a French multinational company, entered into a partnership with Berkana Resource Corporation, a global SCADA consulting company to develop a software solution with integral security and compliance support, while ensuring solutions meet the Pipeline and Hazardous Materials Safety Administration regulatory requirements. On the acquisition front, in April 2013, Honeywell acquired RAE Systems, a leading gas detection company. This acquisition would help Honeywell to position its offerings across high-growth regions, as RAE Systems has a strong presence in China. A year earlier, Honeywell acquired Saia-Burgess Controls, a manufacturer of electronic components for automation engineering. This acquisition enhances Honeywell’s intelligent building controls portfolio. It expands Honeywell’s energy controls presence in Austria, Germany, and Switzerland. Some of the major technology vendors include ABB Group, General Electric, Schneider Electric, Huawei Technologies, Senstar, and Accenture. 13.9 Huawei Technologies Co. Ltd.